Willy Brandt (18 December 1913 – 8 October 1992) was a German chancellor from 1969 until 1974. He was born Herbert Ernst Karl Frahm in Lübeck, Germany. He was the leader of the Social Democratic Party of Germany 1964–1987 and winner of the Nobel Peace Prize (1971). He died on 8 October 1992 in Unkel on the Rhine. He was born as son of Martha Frahm and John Möller in 1913 in Lübeck. He never met his father and grew up with his mother and his grandfather. He fled to Norway when the Nazis took over government in Germany. He led a contact office for the resistance against the Nazi regime. After he lost his German citizenship, he became Norwegian. The Germans arrested him when they occupied Norway. He fled to Sweden. In 1945, Brandt returned to Germany as writer for Scandinavian newspapers. His political career started in 1948. He became a representative for the SPD in the Bundestag for a district of Berlin. He was member of the state parliament of Berlin from 1950 until 1971. He became president of the Parliament of Berlin (1955) and Mayor of Berlin (1957). Willy Brandt started to campaign for the position as Chancellor (Bundeskanzler) for the Social Democrats (SPD) in 1961. In 1966, he became Vice-Chancellor of the "Grand Coalition" of SPD and the Christian Democratic Union of Germany (CDU) under Chancellor Kurt Georg Kiesinger. He started the social-liberal coalition between the SPD and the Free Democratic Party of Germany (FDP). Willy Brandt became Chancellor in 1969. The New Eastern Politics of Western Germany. He travelled to East Germany, Warsaw and Moscow to improve relationships. His acceptance the Oder-Neisse Line and many of controversies in the Parliament and society followed. In 1971, he got the Nobel Peace Prize for his politics. In 1972, Rainer Barzel of the CDU believed he could end the Brandt administration, but he failed to win the vote of no-confidence. Brandt was re-elected to a second term later that year. In 1974, Günther Guillaume who worked in Brandt's office was discovered to be a spy. Brandt resigned and Helmut Schmidt became chancellor. Brandt stayed leader of the SPD, and later of the Socialist International too. He was member of the European Parliament from 1978 to 1983. He gave up the position as chief of the SPD in 1987. 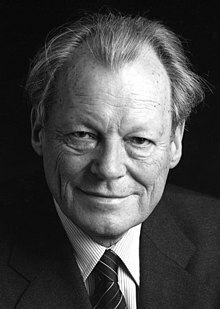 Willy Brandt died of colon cancer at his home in Unkel, a town on the River Rhine, on 8 October 1992, at the age of 78. He was given a state funeral and was buried at the cemetery at Zehlendorf in Berlin. ↑ Binder, David (1992-10-09). "Willy Brandt Dead at 78; Forged West Germany's Reconciliation With the East". The New York Times. ISSN 0362-4331. Retrieved 2017-04-17. ↑ MARSHALL, TYLER (1992-10-18). "Germans Lay Beloved Statesman Brandt to Rest : Funeral: 'He shaped an era,' the country's president says of the former West Berlin mayor, foreign minister and chancellor". Los Angeles Times. ISSN 0458-3035. Retrieved 2017-04-17. This page was last changed on 7 February 2019, at 02:17.